The genius first-year student who reads barefoot in the library, Ichinose Kotomi often brings her own cushion to kneel on as well as food to eat. She never attends class but always seems to ace tests. When approached by other people, she might refuse to respond unless specifically called "Kotomi-chan". When well-intentioned people help her make some friends, giving her an example of how to introduce herself, Kotomi copy/paste spams the same exact message to every stranger she sees. Establishing social contact with her is not easy because she thinks everyone, except the most timid people, is being mean to her. 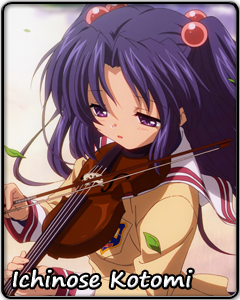 Kotomi also likes playing the violin, and her friends set up a violin recital for her, despite the fact that humans (and domesticated animals) dislike her playing it. A lot.